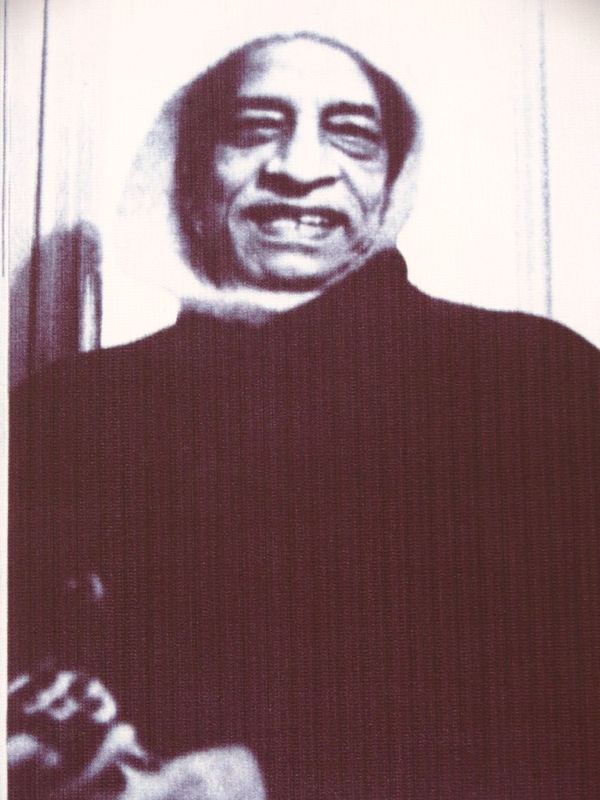 by The Hare Krishna Movement in A.C. Bhaktivedanta Swami Prabhupada, Bhaktisiddhanta Sarasvati Thakura, Srila Prabhupada's Books, Srimad Bhagavatam Tags: A. C. Bhakthvedanta Swami Prabhupada, back to Godhead, constructing temples, His Divine Grace Srila Bhaktisiddhanta Sarasvati Thakura Prabhupada, importance of printing books, publishing books, SB 8.1, spiritual master, Srila Prabhuada, Srimad Bhagavatam, Summary 8.1. The following is an excerpt from the summary for Canto 8, Chapter 1 of the Srimad Bhagavatam, wherein Srila Prabhupada is describing the instructions given to him at Radha Kunda in August of 1935, by his spiritual master His Divine Grace Srila Bhaktisiddhanta Sarasvati Goswami. Yesterday we celebrated Vyasa-Puja at New Vrindaban. The Vyasasana there was freshly re-upholstered and decorated, thanks to the efforts of Lokadrsti devi and Malati devi (who provided the fabric.) It was a very nice day with a good kirtan, dancing and feasting, all centered around Srila Prabhupada! 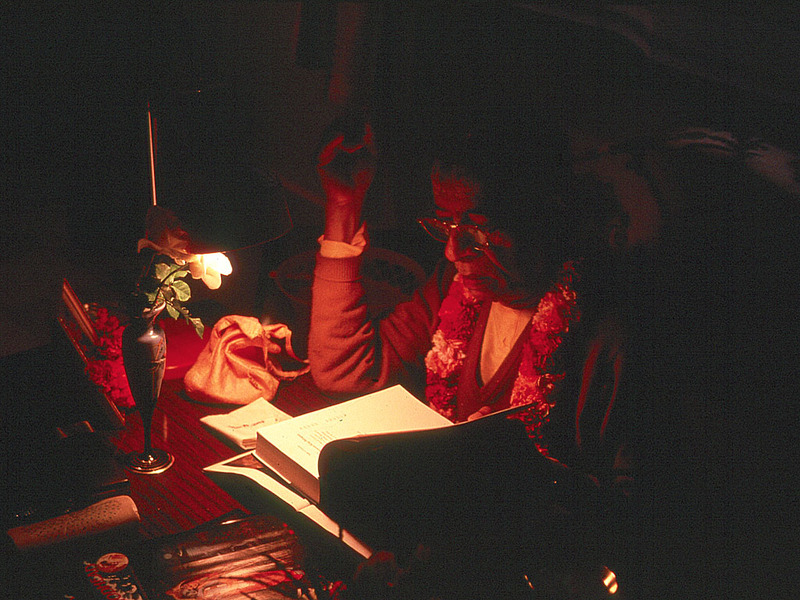 Latley I have been reading some of Srila Prabhupada’s early Essays & Articles, as can be found at Prabhupada Books. The following “The Real Peace Formula” is an example of his early writting. I was reading from the this 29th chapter, that by chanting Hare Krishna, one can become purified of all material contamination and return home, back to Godhead. In the purport to verse 48 it is mentioned; “Generally people are not aware of their interest in life—to return home, back to Godhead. People do not know about their real home in the spiritual world. 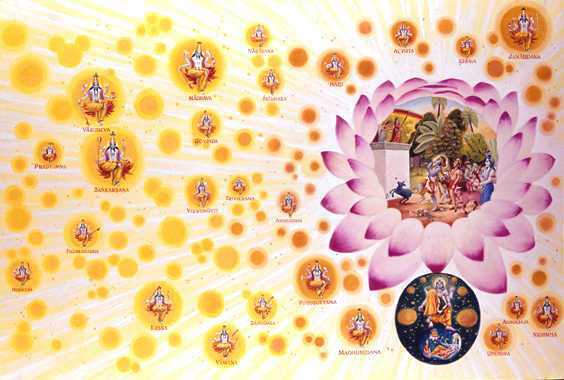 In the spiritual world there are many Vaikuṇṭha planets, and the topmost planet is Kṛṣṇaloka, Goloka Vṛndāvana. Despite the so-called advancement of civilization, there is no information of the Vaikuṇṭhalokas, the spiritual planets…The real attempt should now be to return home, back to Godhead…One should be intelligent enough to return to Godhead. One should be interested in information about the spiritual Vaikuṇṭha planets, and in particular the planet known as Goloka Vṛndāvana, and should learn the art of going there by the simple method of devotional service, beginning with hearing and chanting (śravaṇaṁ kīrtanaṁ viṣṇoḥ [SB 7.5.23]). Sometimes when reading the Bhagavad-gita As It Is by His Divine Grace A. C. Bhaktivedanta Swami Prabhupada, a verse or purport will just jump out at me, as it did this morning. No matter how many times I read the Bhagavad-gita, because it is transcendental literature, it is everfresh and new. Every reading has new and deeper realizations…as was the case with this important verse and purport. Anyone who wants to approach the Supreme of all the Personalities of Godhead, on the Kṛṣṇaloka planet in the spiritual sky, and be intimately connected with the Supreme Personality, Kṛṣṇa, must take this formula, as is stated by the Supreme Himself. Therefore, this verse is considered to be the essence of Bhagavad-gītā. The Bhagavad-gītā is a book directed to the conditioned souls, who are engaged in the material world with the purpose of lording it over nature and who do not know of the real, spiritual life. The Bhagavad-gītā is meant to show how one can understand his spiritual existence and his eternal relationship with the Supreme Spiritual Personality and to teach one how to go back home, back to Godhead. Now here is the verse which clearly explains the process by which one can attain success in his spiritual activity: devotional service…. 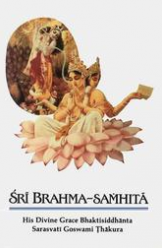 This is a very nice lecture by His Divine Grace from the sixth Canto of the Srimad Bhagavatam, recorded July 12th, 1975, in Philadelphia, PA.
…Once upon a time, thousands of sages came together in the holy place called Naimisaranya to perform sacrifice. 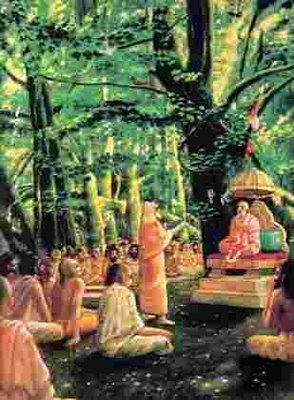 To their very good fortune the great sage Suta Goswami, who had been traveling to different pilgrimage sites, arrived there along with his disciples. The sages present were very enlivened to see him. They all stood up immediately to pay their respects to the great sage, offered him a very nice Vyasasana, and requested him with folded hands to sit down on it. The sages of Naimisaranya said to Suta Goswami with folded hands, “O Sutaji! We humbly request you to tell us something about the wonderful activities and pastimes of the Supreme Personality of Godhead. There are many thousands of such narrations, but we want to hear the most perfect one, by following which we can all be delivered from this Material Ocean and return back to Godhead. * Establish the Deity or Picture of Sri Sri Radha Krishna in your home and worship Them with love and devotion. * Study Srimad Bhagavatam and Bhagavad gita, especially Chapter Fifteen, Purushottama Yoga. * Daily offer a ghee lamp to Sri Sri Radha Krishna. * Give charity to qualified Brahmanas. Engage in Go Seva and distribute prasadam. * Bathe in the holy rivers and associate with saintly devotees. …In this very interesting verse, it is described that vipadaḥ—calamities or dangers—are very good if such dangers and calamities remind us of Kṛṣṇa. Here Kuntīdevī speaks of apunar bhava-darśanam. The prefix a means “not,” and punar bhava means “repetition of birth and death.” The real danger is the repetition of birth and death. That must be stopped. As long as we are in this material world, there must be calamities because this is the place of calamity. But even with calamities our business should be to develop our Kṛṣṇa consciousness, so that after giving up this body we may go back home, back to Kṛṣṇa. Generally, the distressed, the needy, the intelligent, and the inquisitive who have performed some pious activities worship or begin to worship the Lord. Others, who are thriving on misdeeds only, regardless of status, cannot approach the Supreme due to being misled by the illusory energy. Therefore, for a pious person, if there is some calamity there is no other alternative than to take shelter of the lotus feet of the Lord. Constantly remembering the lotus feet of the Lord means preparing for liberation from birth and death. Therefore, even though there are so-called calamities, they are welcome because they give us an opportunity to remember the Lord, which means liberation. One who has taken shelter of the lotus feet of the Lord, which are accepted as the most suitable boat for crossing the ocean of nescience, can achieve liberation as easily as one leaps over the holes made by the hooves of a calf. Such persons are meant to reside in the abode of the Lord, and they have nothing to do with a place where there is danger in every step. …When Lord Caitanya talked with the great devotee Ramananda Raya, the Lord asked him, “What is the basic principle of human life?” Ramananda Raya answered that human civilization begins when varnasrama-dharma is accepted. Before coming to the standard of varnasrama-dharma there is no question of human civilization. Therefore, the Krsna consciousness movement is trying to establish this right system of human civilization, which is known as Krsna consciousness, or daiva-varnasrama—divine culture. There is a misconception that the Krsna consciousness movement represents the Hindu religion. In act, however, Krsna consciousness is in no way a faith or religion that seeks to defeat other faiths or religions. Rather, it is an essential cultural movement for the entire human society and does not consider any particular sectarian faith. This cultural movement is especially meant to educate people in how they can love God. Sometimes Indians both inside and outside of India think that we are preaching the Hindu religion, but actually we are not. One will not find the word “Hindu” in Bhagavad-gita. Indeed, there is no such word as “Hindu” in the entire Vedic literature. This word has been introduced by the Muslims from provinces next to India, such as Afghanistan, Baluchisthan and Persia. There is a river called “Sindhu” bordering the northwestern provinces of India, and since the Muslims there could not pronounce “Sindhu” properly, instead they called the river “Hindu,” and the inhabitants of this tract of land they called “Hindus.” In India, according to the Vedic language, the Europeans are called mlecchas or yavanas. Similarly, “Hindu” is a name given by the Muslims. “Consider this example: when the sun is in the sky, there is no question of darkness. Similarly, when the Hare Krsna mantra is vibrating on your tongue and you are hearing attentively, then your consciousness becomes Krsna consciousness, or clear consciousness, and there is no question of maya, or hazy consciousness. Just as when light and darkness come together the darkness cannot stand before the light, maya cannot remain in the presence of Krsna. …It is related that by his constant association with the Lord, Sudama had wiped away from his heart whatever contamination was remaining, and he was very shortly transferred to the eternal spiritual kingdom, which is the goal of all saintly persons in the perfectional stage of life. It is stated in the Krsna Book that whoever hears this history will become qualified like Sudama and will be transferred to the spiritual kingdom of Lord Krsna. The wonderful history of Krsna and His friend Sudama is told in its entirety in the Krsna Book, Volume II, by His Divine Grace A.C. Bhaktivedanta Swami Prabhupada. Srila Prabhupada is kindly presenting to the western world the pastimes of Lord Krsna, which can act as a merciful shower upon the hearts of all of us. It is true that we have forgotten our eternal, blissful and loving relationships as servants of Krsna or God. The remedy to forgetfulness or ignorance of God is to hear about Him from the lips of His pure devotee. This is the view of authorized scriptures. 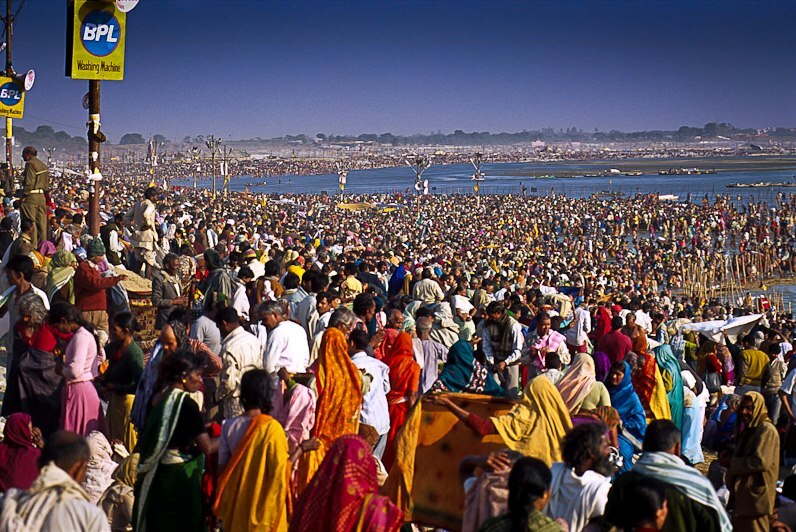 When Krsna descends from His eternal abode in the spiritual world and appears to this mundane world, as He did 5,000 years ago, He engages with others just as if He were an ordinary human being. Although He is unborn, He appears to have a mother and father. In the village of Vrndavana Krsna plays as a cowherd boy. He enacts these pastimes for His own transcendental pleasure and to attract all the suffering living entities back home, back to Godhead. 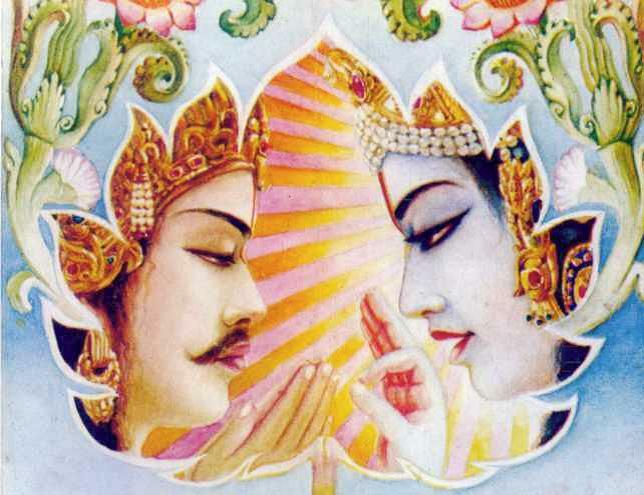 Sudama was among those devotees who were childhood friends with Krsna, and Sudama was also His intimate school friend. 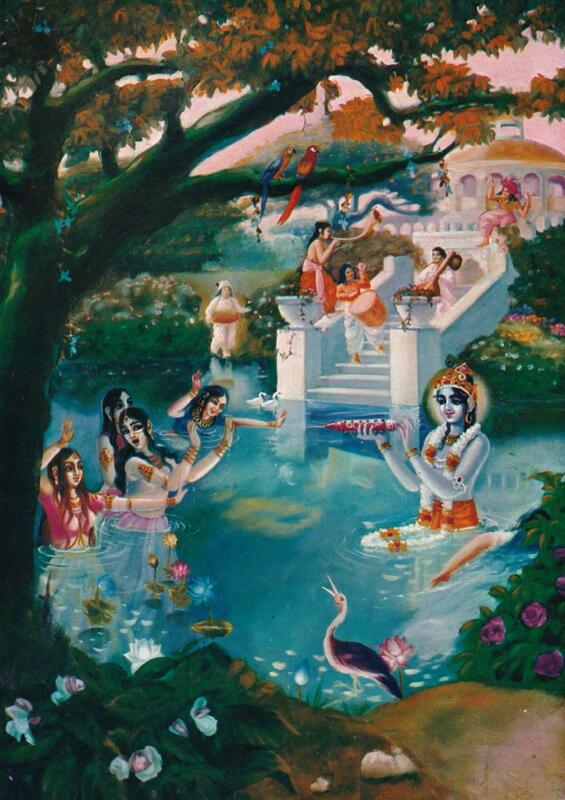 Because Vrndavana is the eternal and entirely spiritual abode of the Lord, it is nondifferent from Him. At Vrndavana, one will find unlimited wealth, strength, fame, wisdom, beauty and renunciation—all the six opulences possessed by the Supreme Personality of Godhead, Bhagavan Sri Krsna. 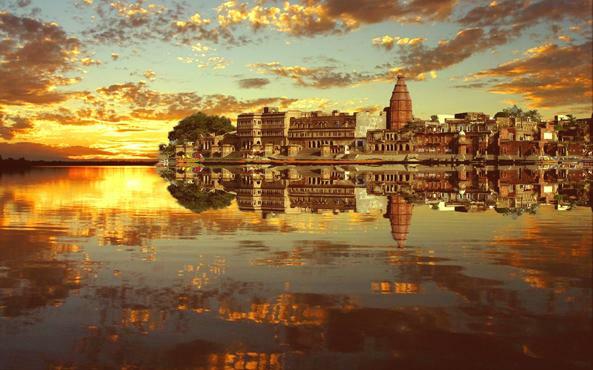 Indeed Vrndavana is Krsna, and, to go there is to perceive God Himself. 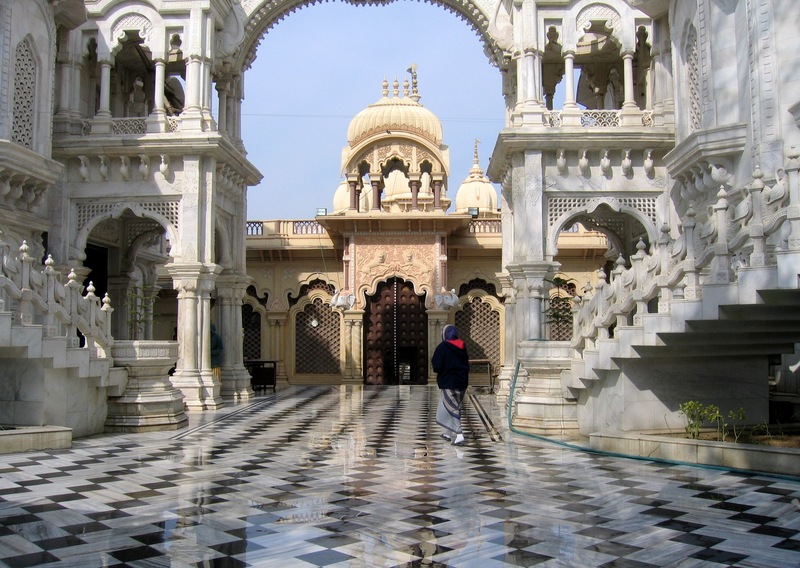 Vrndavana, India, is that sought-after eternal resting place because it is at Vrndavana that Lord Sri Krsna, the Supreme Personality of Godhead, descended to this planet five thousand years ago. The Lord’s appearance and activities are not mundane; they are completely transcendental. 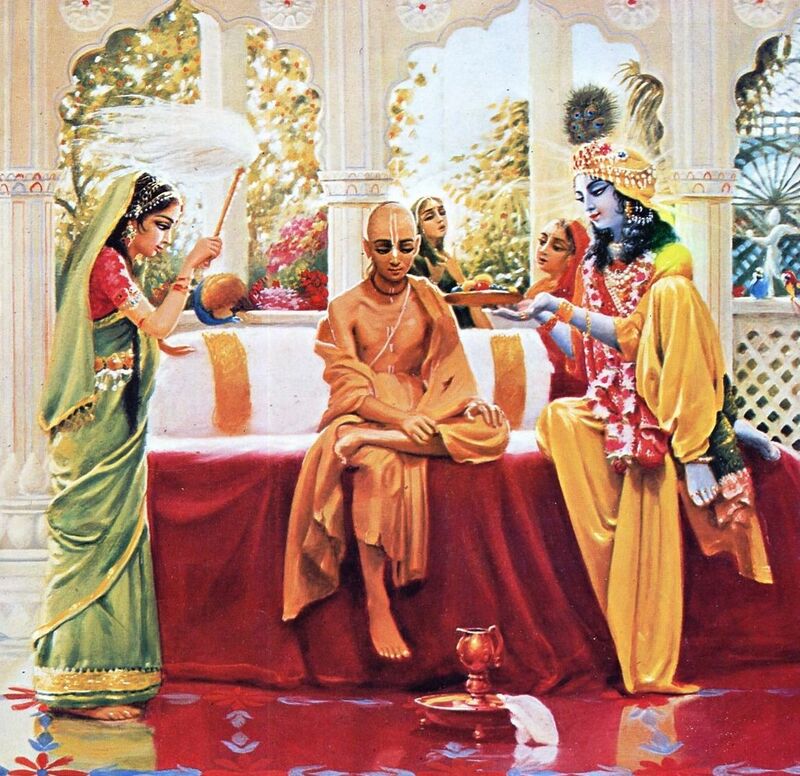 Just as a king may travel with all his retinue, set up camp, and conduct his affairs of state in the same style as if he were in his palace, Lord Krsna brought with Him all His transcendental associates and paraphernalia and created on earth an exact replica of the spiritual world, known as Goloka Vrndavana. Srila Prabhupada, as a pure devotee free from all defects, can transmit the Absolute Truth as it has been carefully set down in the Vedic literature, like a mailman who delivers a letter without opening it to add or subtract something. 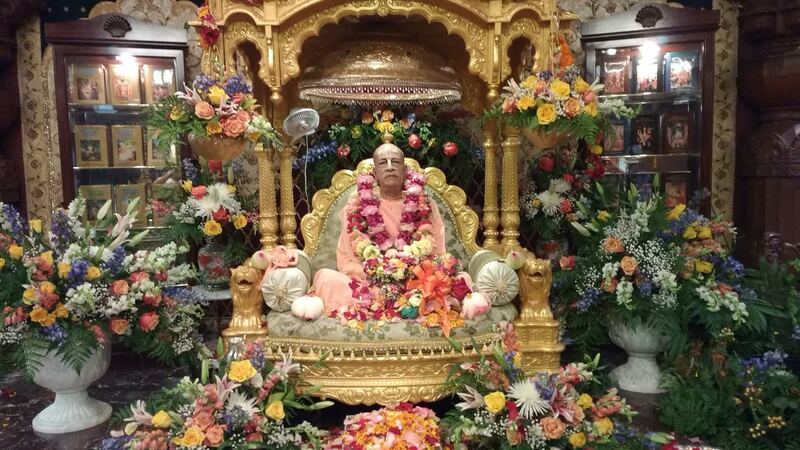 Because Srila Prabhupada is qualified to receive the king of all education, he is empowered to pass it on purely. His books are considered Vedic literature because they are in pursuance of Vyasadeva’s original intentions. 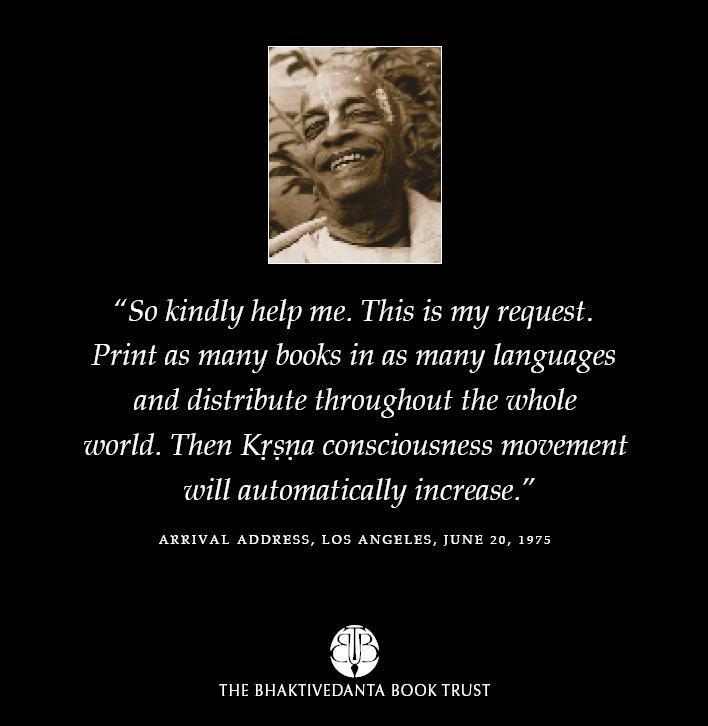 Thus Srila Prabhupada’s translations and purports are nondifferent from the original instructions delivered 5,000 years ago by Lord Krsna. 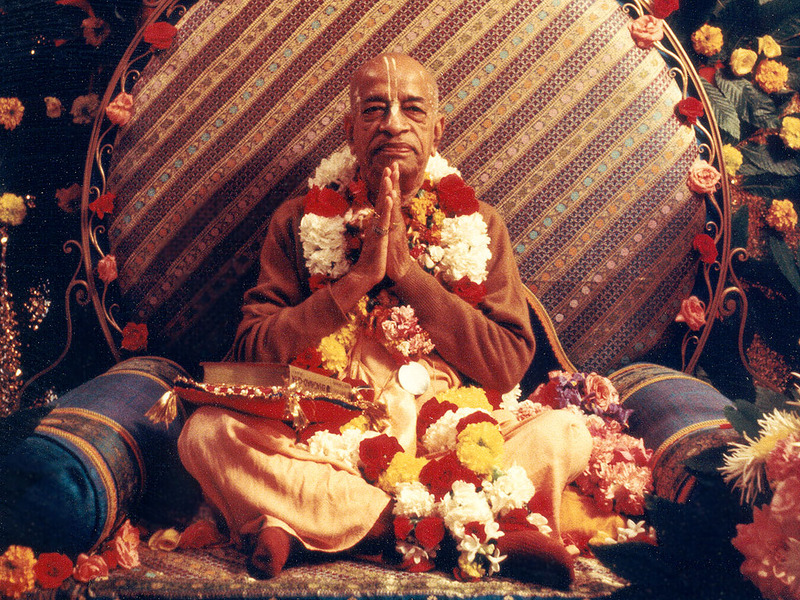 One day when several of Srila Prabhupada’s leading disciples were assembled before him, he announced that he had been requested to write a summary study of the Tenth Canto of the Srimad-Bhagavatam. 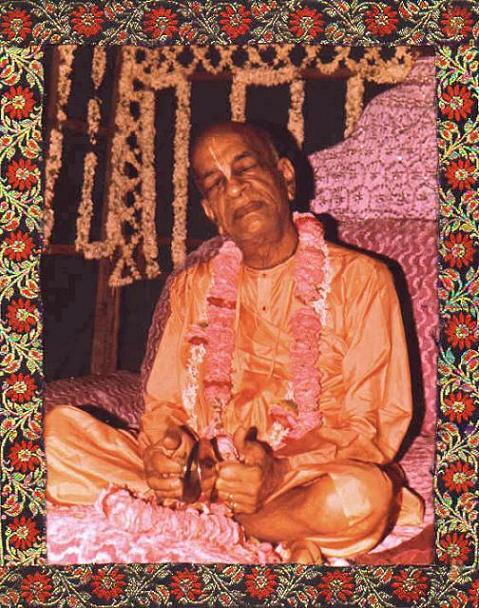 If Srila Prabhupada proceeded translating canto by canto, some students feared, he might not be able to complete the confidential Tenth Canto in his life time. Because this portion had been so misrepresented by materialistic religionists, he wanted to leave behind an edition which presented this important portion in its proper transcendental perspective. He took our approval and then began dictating Krsna, the Supreme Personality of Godhead. This work is the most entertaining of all of Srila Prabhupada’s books. He conceeded that he was writing it in such a way that the reader would not detect the philosophy. In the Bhagavatam, Sukadeva Gosvami, its principal reciter, has declared that there are three classes of men who will be attracted to Krsna’s pastimes. Those very advanced in transcendental realization, the liberated souls, will relish the pastimes. 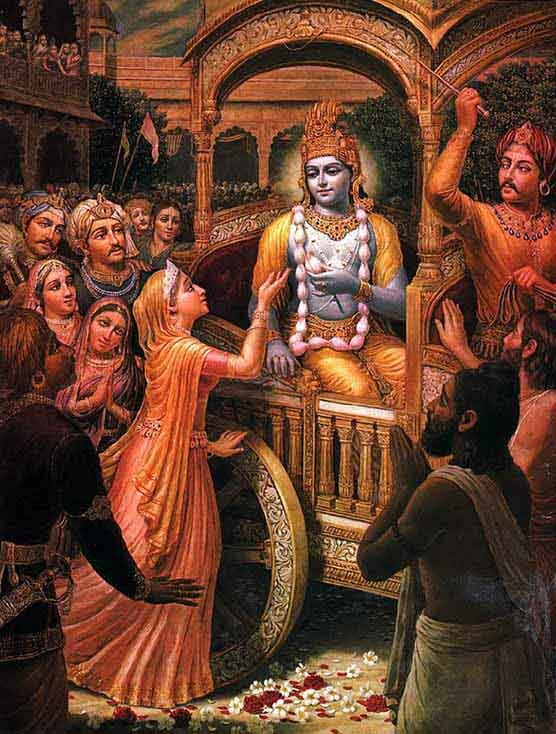 Those who are on the path to achievement of liberation will automatically be purified, and even the gross materialist will enjoy them because of the resemblance between Krsna’s affairs with the gopis and the love affairs between ordinary men and women. Srila Prabhupada teaches the most difficult and sublime science—the science of how to serve God—in such a way that anyone can understand it. The concepts are presented over and over again, for repetition is a time-tested learning technique in transcendental study. Thus in whichever of Srila Prabhupada’s books one reads first, one will find the entire science of Krsna consciousness presented, yet each succeeding book reveals something more, and with each rereading one will find new light. Srila Prabhupada’s books are the most wonderful vehicle because they swiftly transport the reader to a timeless and ever- green world where everyone is joyfully awakened to the Absolute Truth of Krsna, the Supreme Personality of Godhead. 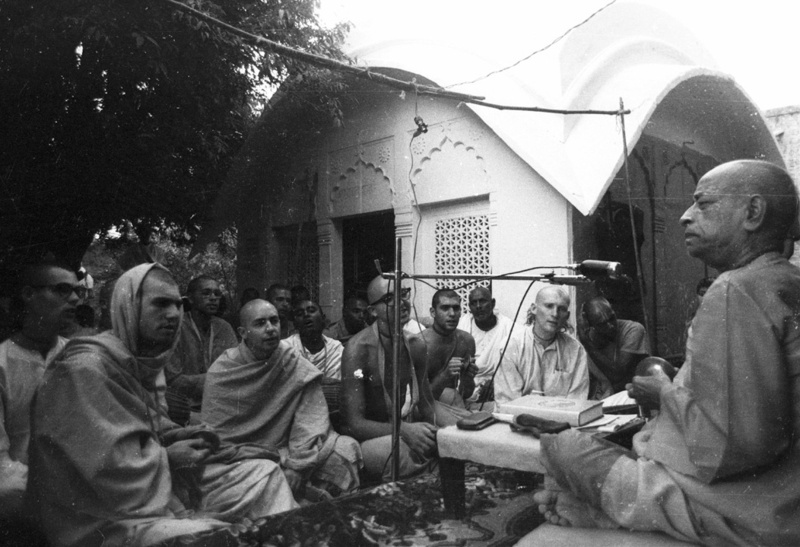 The next book, Teachings of Lord Caitanya, was then dictated. 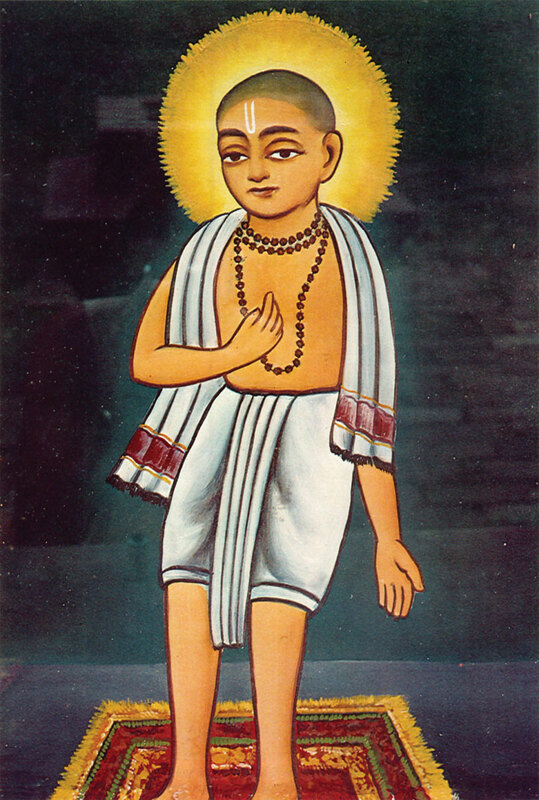 It is a summary study of the historic Caitanya-caritamrta. 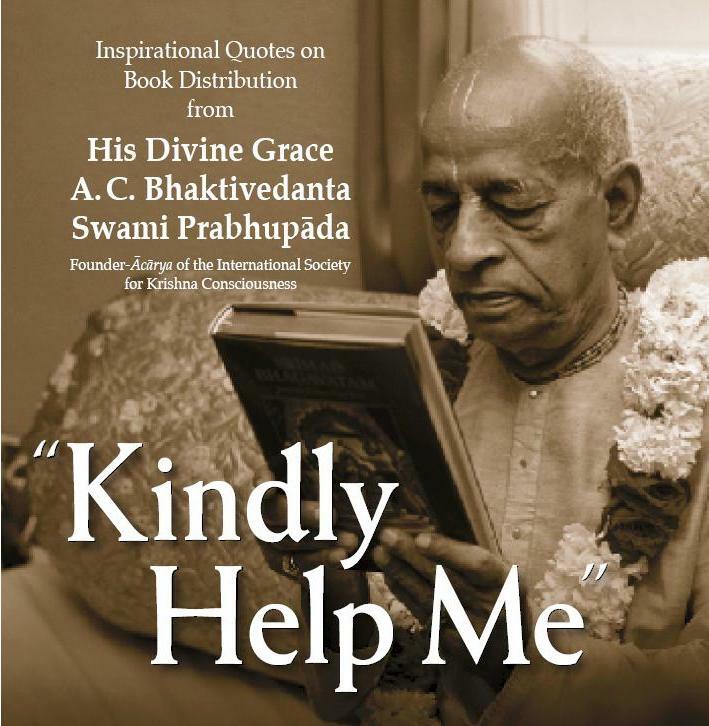 Instead of the exhaustive format of verse to verse translation and purport, Srila Prabhupada presented this book in a shortened but more essential manner. “My books are for my students,” he told us, and so he wanted to write as many as possible. If Bhagavad-gita could be considered the undergraduate study of spiritual life and Srimad-Bhagavatam the master’s study, then Caitanya-caritamrta is the doctorate course. It recounts Lord Caitanya’s teachings to the only five disciples He personally taught. In Teachings of Lord Caitanya, the incomplete philosophy of impersonalism is fully analyzed and forcefully defeated by Lord Caitanya in His discussions with the two biggest impersonalists of His time, Prakasananda Sarasvati and Sarvabhauma Bhattacarya. 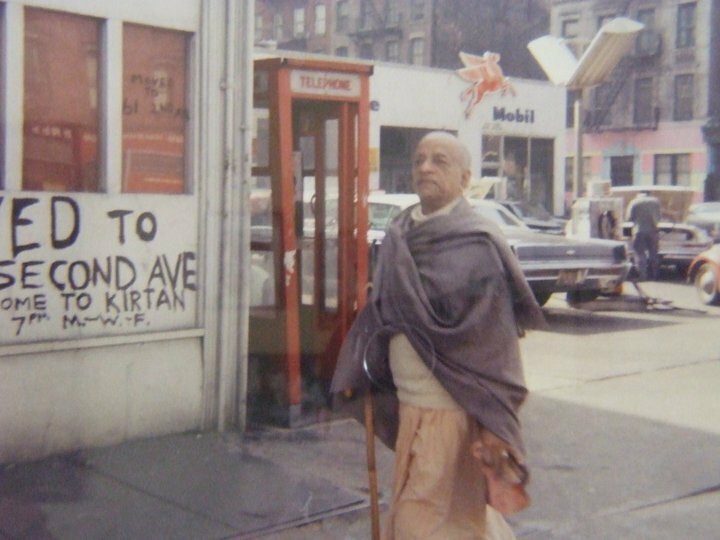 Also, the quintessence of all detailed knowledge of Krsna and how He acts both in the spiritual and material worlds is disclosed to Ramananda Raya. In 1972, when Prabhupada gave a series of lectures on The Nectar of Devotion for one month in Vrindavan, a thought was plaguing me. When I first joined, I’d been taught that the parampara system is like a chain, and if you’re not initiated, if you’re not linked up to this chain, then you can’t go back to Godhead. 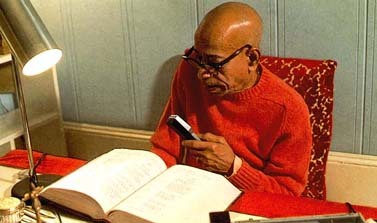 I thought, “We’re distributing so many books, but if the people who read them are not initiated, then they can’t go back to Godhead.” So, one day I followed Prabhupada from Rupa Goswami’s samadhi, where he lectured, and just before Prabhupada stepped onto his courtyard, I said, “We’re distributing so many books but if people aren’t initiated, then they can’t go back to Godhead.” Prabhupada turned, looked at me right in the eyes and said, “Just by reading my books they are initiated.” I thought, “That is an incredible example of compassion.